The lower interest rates have gone, the more money we have put on deposit. Doesn’t make any sense, does it? But that’s the way it is. The Central Bank has just reported that we Irish citizens now have nearly €91 billion on deposit with our banks, building societies and credit unions. That’s the highest level of household deposits since 2010. 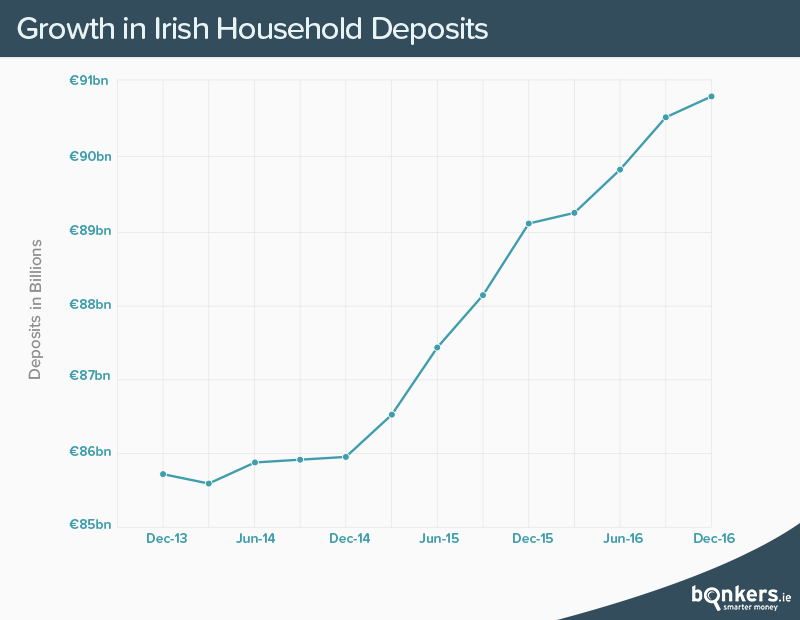 At last count, there were just over 1.7 million occupied households in Ireland which means that an “average” Irish household now has €53,000 on deposit. And what’s even more extraordinary is that interest rates have fallen steadily over the last four years making it less and less attractive for savers. Yet we keep on socking away the cash. Back in 2013 you could get a decent 3.0% return on benchmark 12-month term accounts from banks like Ulster Bank, Permanent TSB and KBC. Now you’d be doing well to get 0.75% on the same accounts. And to add insult to injury, the government cranked up the rate of DIRT to 41% at the start of 2014. It was reduced in the last budget, but still stands at a punitive 39%. The savings environment is so bad right now that if you had €10,000 to put on deposit for a year, you’d get just €44 at the end of the term. Your ten grand wouldn’t even earn you a euro a week, and that’s in the best term account! It's as though the banks and the government have done everything they can think of to discourage us from saving and yet we have just kept on doing it. The banks are paying us a quarter of what they were only a few years ago and yet we keep giving them our money. Then the lend it right back to us for ten times as much. They must be delighted. So why have we keep on saving even when deposit interest rates are so low? Lack of consumer confidence would normally be the answer. When confidence is low, people save. Just like they did after the boom. But why are people saving so much now? It doesn't make sense. A recent report commissioned by KBC said that consumer confidence was at a 10 year high, the economy is also improving, and unemployment has just hit it's lowest level in nine years at 6.2%. Then consider that we receive practically no return on our savings. Surely we should let loose a little and start spending right? Well, a badly bruised housing market may have a lot to do with it. Many people, particularly first time buyers, could not buy homes because the credit was simply not available. When banks began cautiously lending again, the criteria were so onerous that most people simply couldn't get a loan - the joke was only a teacher married to a civil servant would even be considered for a mortgage. So people saved. But the Central Bank just relaxed their mortgage lending rules in January. And it's this event, in tandem with a growing economy and the availability of credit, that may suddenly reverse this savings trend. Watch this space. N26 versus Revolut - how do they compare?